Rocky Ripple Living Room Series presents:Saturday, January 23rd | Music begins PROMPTLY at 6:30 PM!!!! 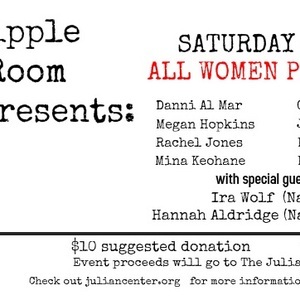 !$10 suggested donation for The Julian CenterSeveral amazing artists on the night! Including:Tentative lineup on the evening (rapid fire sets)6:30 - 6:50 Danni al Mar6:50 - 7:10 Glory Sheeley7:10 - 7:30 Rachel Maré Jones7:30 - 7:50 Megan Hopkins7:50 - 8:10 Jen Roberts8:10 - 8:30 Katie Josway8:30 - 8:50 Kyra Waltz Music8:50 - 9:10 Mina Keohane9:10 - 10:00 Hannah Aldridge10:00 - 10:40 Ira WolfThis is a public event. Just shoot me a message if ya don't know me, then we won't be strangers! All I ask is you be respectful to the artists and the house!Unlike the house jams, this living room series is intended to provide featured artists with a respectful listening room. In the past I've had a number of incredible acts walk through those bungalow doors, and I can guarantee you that this is not one to miss out on! Guaranteed.